Diana and I had the pleasure of meeting Dave Russell and Christine Carpenter of Ride Like A Pro Maryland when we attended the 2010 Delaware/Marland State HOG Rally last summer. Christine is a sweetheart! She is the Director and I gather she takes care of the business details while Dave tends to the instructing (and she rides her own Heritage Softail®). Dave is the Ride Like A Pro instructor with an air of southern hospitality who looks great in Hi-Viz orange. He and his staff of rider coaches teach the Ride Like A Pro techniques in southern Maryland. They are friendly people that put you at ease and make learning fun. Dave is an excellent speaker who uses his hands, arms and whatever else it takes to demonstrate the physicality involved with handling your motorcycle in slow tight manuevers. I began riding when I was in my teens. But after graduation, work and increasing responsibilities began to take center stage for me. So riding became a thing of the past. Sure, I still thought about it from time to time, but I knew purchasing a motorcycle was out of the question, at least for a while, maybe a long while. Then one day, many years later I realized that my girls were all grown now and I still have a desire to ride. So I decided to take some time to think about it and gather information, including all the changes that had taken place within the industry over the years. By the end of January 2005 I decided that I was ready and I walked into the local dealership to order a new Road King. It would take up to 3 months to arrive, so I decided to spend the time wisely. I immediately enrolled in the MSF motorcycle classes at the local college and began to read every book and article I could get my hands on. In April the call came announcing the arrival of my new Harley-Davidson motorcycle. I could hardly believe it! I was thrilled! Over the next few months I took my time getting back into riding again and adjusting to the vast differences of the new and heavier machine. I enjoyed each of the classes I had taken and learned a lot of valuable information; but I knew I still had much more to learn. As time past and I logged more miles (12,000 my first year) I began to evaluate my overall skills and abilities. I was still having a huge problem turning at slow speeds. It seemed nothing I had learned up to that point addressed this specific problem. I dreaded certain times in slow moving traffic or riding in congested areas or worse yet, the thought of having to make a U-turn on the roadway! I can still recall the awful feeling I would get each time I found myself in a situation like that. I asked more experienced riders about it but no one seemed to have an answer. On chapter rides I noticed that all of the other riders were apparently facing the same problems. It was as if everyone duck walking the bikes around corners was an accepted part of riding. But I could not let it go. I knew there had to be a solution and I was determined to find it. Then, one day while I was leafing through a magazine, I came across an article by “Jerry The Motor Man Palladino”. In the article Jerry explained 3 simple techniques used by Motor Officers, which when used properly allows them to take complete control of their heavy cruisers at slow speeds, even in tight maneuvers. I could not believe what I was reading! I thought this was the answer to my prayers! I rushed home and poured over the “Ride Like A Pro” web site reading every word. Then I ordered a copy of the DVD and waited anxiously for it to arrive. When it came, I watched it several times in complete amazement! I had never seen anyone ride like that before! I was thrilled to have the information as I studied every detail very carefully. I could not wait to begin practicing the techniques on my own. As often as I could, I would go to the parking lot and set up a practice course as shown in the practice guide. In no time it seemed, I began to see a tremendous improvement in my slow speed riding skills. I also noticed that I was having a heck of a lot of fun too! In fact, I was having more fun in the parking lot practicing U-turns, figure 8’s and circle exercises than I had been having out on the open road. Suddenly all the stress and fear that I experienced before just seemed to melt away. And for the first time, I really knew how to ride and was truly free to enjoy every aspect of motorcycling. I became so excited about the huge impact that Jerry’s DVD had had on me, I began sharing it with my friends. I told them about it and even provided a brief demonstration by performing a few tight U-turns, circles and figure 8’s right in front of them. They couldn’t believe it! Everyone was amazed to see me riding with such control and confidence. They wanted to know how they could learn to ride like that too. So I told them how to get to the “Ride Like A Pro” web site and began to organize and conduct practice sessions each week for myself and my friends. In 2006, while I was at the Tennessee State HOG Rally, I had a chance to meet “The Motor Man” himself and his lovely wife Donna. As I was a big fan, I wanted to thank each of them for the DVD’s and to tell them personally about the enormous impact they had on me and all of the riders that were attending our classes. Jerry and Donna were very happy to hear about the success and popularity of our program. I stayed in touch with them with calls from time to time to ask Jerry a question or two or to just to say hello. In December 2009, during another a telephone conversation with Jerry, he asked if I would come to Tampa to help him with an up-coming class. Actually he said “the main purpose would be to discuss starting a Ride Like A Pro Franchise in Maryland”. I was completely surprised. But after a quick call to Christine (my fiancée) to share the news and run the idea by her, I quickly called Jerry back to accept his offer and to let him know that I would be on my way. Three days later it became official, “Ride Like A Pro of Maryland” had become a reality. Looking back, I can honestly say that it has been an amazing and rewarding experience. Christine and I feel honored and privileged to be able to do something we both love so much, which is to help others to become safer and to fully enjoy the sport we are so passionate about. 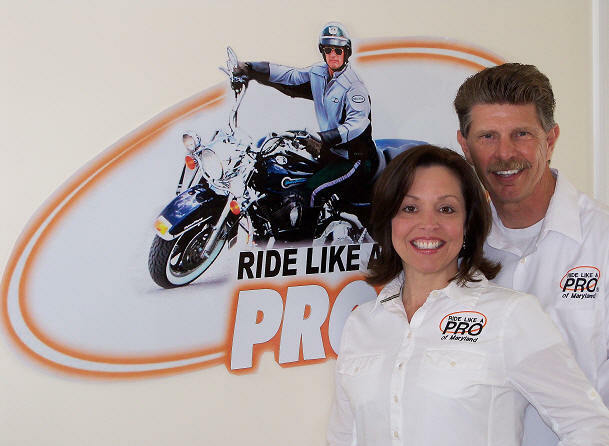 We would also like to extend our sincere gratitude to Jerry and Donna Palladino for the opportunity to be a part of the “Ride Like A Pro Family”. And to our families and closest friends, including Ray & Jan Hart, Mike & Dawn Everhart, Dan & Marie Ford and Ray & Tess Short, we can’t thank you enough for your continued love and support.